On 5th March 1919, a First World War army camp at Bodelwyddan near Abergele in North Wales was the scene of a bloody riot that left five soldiers dead and 23 injured. 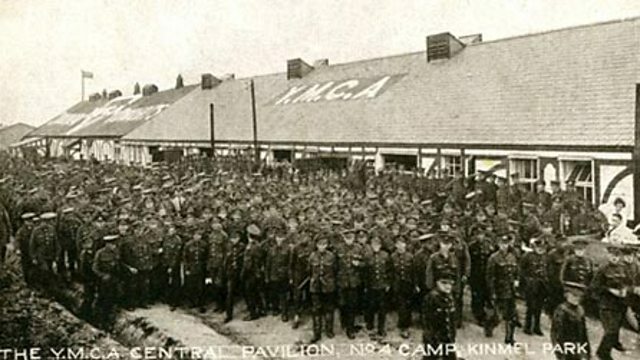 Kinmel Park Camp was built in 1914 as a training camp for Lord Kitchener’s Army in preparation for serving overseas. It had its own branch railway line connecting to the main line at Rhyl. There was also a trench warfare training area which can be seen today to the rear of Bodelwyddan Castle. In March 1919, some 15,000 Canadian troops were billeted at Kinmel camp awaiting repatriation to Canada. In late February 1919, it was learned that troop ships originally allocated to the Canadians had been re-allocated to the American forces – who had certainly not served in France for half as long as the Canadians – it caused understandable resentment. Then came the news that the Canadian 3rd Division – known to the military authorities as the Fighting Division – was to be given priority over other Canadian troops. The men at Kinmel were outraged, both at the implied slander on their reputations and on being once again pushed down the list for repatriation. Conditions at Kinmel Park were very basic. The place was a sea of mud and strikes had held up the delivery of both fuel and food supplies. As a result, the men were on half rations and as many had received no pay for over a month. They were sleeping 42 to a hut, in accommodation that had been designed for no more than 30. Men were taking it in turns to sleep on the floor and most of them had only one blanket to keep them from the cold of a north Wales winter. Several delegations were sent to the senior officers in the camp, protesting about conditions and the way the men felt they were being treated. Nothing was done. Eventually, tempers boiled over and the discontent became direct action. Some groups started to loot the quartermaster’s stores and the sergeants’ mess. Officers quickly established a defensive perimeter and ammunition was issued to those soldiers considered to be trustworthy and loyal. The rioters had a few rifles but, in the main, they had to improvise weapons, strapping razors to broom handles or sticks. When 20 of the mutineers – because it was by now considered a full-scale mutiny – were seized, the rest simply charged the guardroom and set them free. Rifle shots were exchanged and, when casualty figures were later added up, it transpired that three rioters and two guards had been killed in the affair. Many others had been wounded or injured. The rioting continued until 4.30 in the morning of 5 March when things seemed to fizzle out and the officers regained control of the camp. Following the riots priority was given to repatriating the Canadian troops. The affair was, as far as possible, hushed up and by 25 March the Canadians had been transported home. The tragedy is that it could not have been done earlier. The Daily Post reported plans to recreate First World War trenches alongside the remaining practice trenches from the original Kinmel Park Camp shown here on the left. The blog of a Welshman who heard the call of hiraeth; the longing for, and bond with Wales; its timeless past, its language, its call to the spirit and its deep connection with the land: the rocks, the earth, the lakes, the rivers, the mountains, the valleys, the trees, the cliffs and the waves. It's the land of Wales. It’s 2018 Churches – keep up! There’s resource out there. 150 years of Welsh rugby – but, more than just a game?